Set oven control to broil. Place steaks on rack in broiler pan. Brush both sides of steaks with oil; sprinkle with garlic salt. Broil with tops 4 to 6 inches from heat, turning once, until of desired doneness (10 to 15 minutes for medium, 160°F). Remove broiler pan from oven. 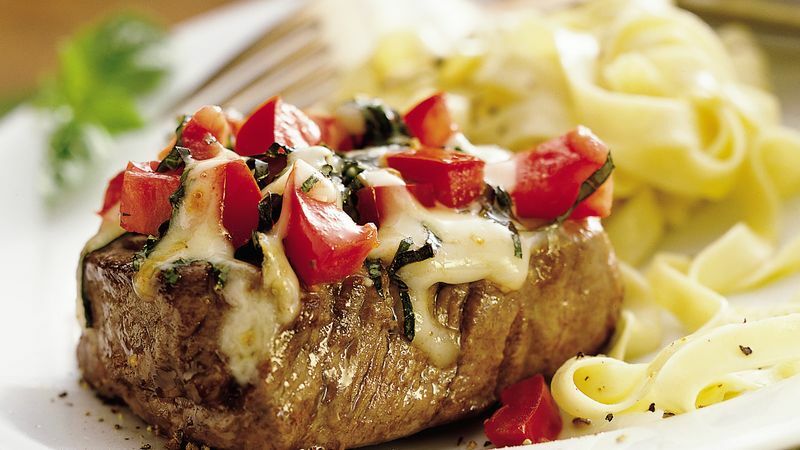 Sprinkle steaks with tomatoes, basil and cheese. Broil about 1 minute or just until cheese begins to melt. Serve immediately. For a meatless of this recipe, fresh portabella mushrooms make a great stand-in for the beef. Remove stems of mushrooms. Place mushrooms, stem sides up, in broiler pan. Brush with oil; sprinkle with garlic salt. Broil with tops about 6 inches from heat 4 to 5 minutes, turning once, until tender. Continue as directed. Here’s a quick way to seed tomatoes: Cut tomato in half horizontally. Gently squeeze the halves to push out seeds. Use a spoon, if needed, to scoop out the remaining seeds.